Tuition Fees: Rs. 75 Lacs. Application Deadline: 10th August and 15th December. Trinity School of Medicine is an opportunity, not just for its students, but for the US and Canada. By educating future physicians in the science of medicine while nurturing their caring instincts, we achieve our goal of improving access to quality healthcare. Trinity School of Medicine carries multiple accreditations, recognations, and formal listings, national and international. Trinity School of Medicine was registered by the National Accreditation Board (NAB) of the Government of St. Vincent and the Grenadines effective April 11, 2008. 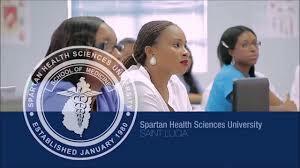 In 2015, Trinity School of Medicine earned accreditation by the Caribbean Accreditation Authority for Education in Medicine and other Health Professions (CAAM-HP), the legally constituted international body established to accredit medical programs in the Caribbean, specifically the St. Vincent and the Grenadines. The standards used by the CAAM-HP are based on the United States medical school accreditation program as outlined by the Liaison Committee on Medical Education (LCME) and are recognized by the World Federation of Medical Education (WMFE) as comparable to US accredited schools. As such, it is concurrently recognized as a viable academic pathway to an MD degree in the United States. As of September 19th, 2016, CAAM-HP, the legally governing accreditation body of St. Vincent and the Grenadines, has been recognized by the National Committee on Foreign Medical Education and Accreditation (NCFMEA, a committee within the US Department of Education) as having accrediting standards comparable to those used to accredit medical programs in the United States. CAAM-HP accredited schools in St. Vincent have been recognized by the US Department of Education as accredited at a standard comparable to United States medical schools, as so governed by the LCME. Not only is Trinity School of Medicine one of those schools, it is the only CAAM-HP accredited school in the country of St. Vincent and the Grenadines. This listing in FAIMER/IMED and the assignment of a code provides the sanction for Trinity students to register for and take the USMLE Steps 1, Step 2 and Step 3 examinations. 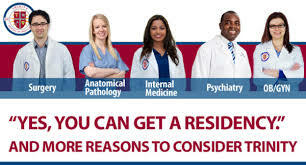 Students who successfully complete Step 1 and Step 2 (CK) and (CS), and otherwise meet the requirements for graduation from Trinity, are then authorized by the ECFMG to register for and participate in the National Residency Match Program (NRMP) as well as the Canadian Resident Matching Service (CaRMS). Finally, Trinity School of Medicine is compliant with the Education Committee for Foreign Medical Graduates (ECFMG) 2023 rule dictating that all international medical graduates be required to have graduated from a school that has been appropriately accredited. USMLE Step 1 – must be taken and passed within three attempts prior to entering the clinical clerkships – after term 5 or during term 6. USMLE Step 2 – Clinical Knowledge (CK) and Clinical Skills (CS) – taken after completing most of the required or in an early elective. USMLE Step 3 – taken prior or shortly after the completion of residency training. ECFMG Certification – Trinity School of Medicine students are eligible for ECFMG certification to sit for USMLE Steps 1, 2 and 3 and they may be certified by the Education Commission for Foreign Medical Graduates (ECFMG) to register for and participate in the National Residency Match Program (NRMP) upon meeting the ECFMG requirements. Why Trinity School of Medicine? Because of Trinity’s affiliation with a 230-bed teaching hospital, clinical experience begins in the first term–reinforcing what students are learning in the core curriculum with personal patient engagement–and continues through all five terms at the campus in St. Vincent and the Grenadines. This clinical experience creates an advantage for students as they begin their clerkships in the U.S.
See for yourself how Trinity students have benefited from choosing a smaller school for their doctor of medicine (MD) degree program. Trinity School of Medicine’s selective admissions process offers students a very low student-to-teacher ratio, offering more personal attention from the accessible, helpful faculty. Students and faculty get to know each other on a personal, often first name basis. Incoming classes are commonly described as feeling like a family. Building on any supplemental instruction faculty may offer as needed, tutors and other learning resources help ensure that students completing the basic sciences and the Introduction to Clinical and Community Medicine are fully prepared to take their place along side students from US and Canadian medical schools for their clinical rotations and beyond. Trinity provides students with a comprehensive USMLE Step-1 preparation program designed to increase performance on the exam. At the conclusion of each term, the program reinforces the most frequently tested USMLE concepts taught in the given term and shows students how to apply what they are learning, as they are learning. Additionally, students can take advantage of personal, supplemental instruction from individual tutors, increasing their opportunity to be as prepared as possible for the next phase. Five-Year Doctor of Medicine Degree Program. Who should consider the Five-Year Doctor of Medicine Degree Program? The 5-Year combined pre-medical and medical degree program was designed for students in countries outside the U.S. and Canada where higher secondary education (and the Higher Secondary Exam) immediately precede entry to professional degree programs. Students who have completed a Higher Secondary Certificate in a Sciences stream including Biology, Chemistry and Physics are strong candidates for this program. The three-term Pre-Medical and ten-term Doctor of Medicine (MD) degree programs, in combination, offer a comprehensive medical education and prepare students for post graduate education in the U.S.
Is acceptance into the MD or Doctor of Medicine program automatic if I pass my Pre-Medical courses? Like any other undergraduate program, certain criteria must be met in order to be enrolled in the Doctor of Medicine program, including a sufficient Grade Point Average in the core sciences. Students who successfully complete all requirements of the Pre-Medical year with a minimum of a 3.0 cumulative grade point average with no more than three (3) grades lower than a B will be considered for promotion to Trinity School of Medicine’s Doctor of Medicine degree program. What is the advantage of Trinity’s Five-Year Program? Enrollment in Trinity School of Medicine’s 5-Year Program will better prepare you for achieving residency and licensure in the United States. The class size for the first year (3 terms) is limited to 25 students.You will attend classes in a year round format (trimesters) building towards promotion to the MD program in year two. The curriculum was designed with the same pre-requisites US students complete to offer you a level playing field for Step 1, Step 2CS and CK and residency. How is the Combined Program Structured? The Scholarship is based on your merit of 12th Marks in PCB and generally, it gets depleted with the initial 15 applications. However, one should try their best to be an early applicant to ensure Scholarship approval. The expenses for returning to India during vacation period would be at your cost separately. Generally, the route taken on your vacation return path is with Transit Visa through Paris / London so as to get more stamps on your passport helping you get B1 Visa during Clinical Rotation . Till March, 2016 the Indian students completing MBBS in India used to give USMLE-1 exam which is an On-Line exam. However, the success ratio was low due to USMLE designed program is completely different than Indian MBBS. The alternative route was provided by us to the Indian doctors. However, from April, 2016, the Government of India came out with its latest regulation to not to issue NORI (No Obligation to return to India) required for Indian MBBS students. Accordingly, it is advisable for the students to pursue the program right from Bachelor level in USA to ensure that you make your medical career in USA!